TRENTON, N.J. -- New Jersey Gov. Chris Christie's trip with his family to a public beach shuttered during a government shutdown drew online mockery and international headlines. Now it's led to a proposed law to stop it from happening again. The Democrat-led Assembly passed a measure Monday that would force the governor's beach house to close during a shutdown, while a second measure they approved would keep state parks open. Those bills still need to be debated in the state Senate and would then need approval from the Republican governor. Watch the report from Action News at 4 p.m. on July 3, 2017. Christie previously pledged to sign a measure the Legislature passed Monday that would pay state workers who were furloughed during the three-day shutdown this month. His spokesman declined to comment on the other measures, referring to office policy not to comment on pending legislation. While Christie made viral headlines Monday over an argument with a Chicago Cubs fan while holding nachos in Milwaukee on Sunday, the Assembly brought the focus back on Christie's last incident. "If a beach is closed because of a state shutdown, it ought to be closed to everybody," said Assemblyman John Wisniewski, a Democrat who proposed the measure to close the beach house during shutdowns. "Having it open to the governor and his guests while it's closed to all the other New Jersey residents who are paying for them to be there isn't right and it isn't fair." 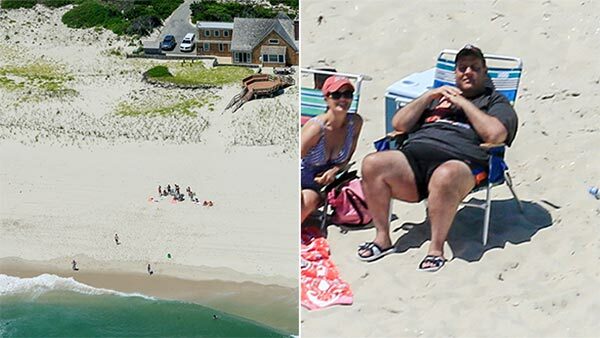 Christie had told reporters earlier that week that he planned to go to the beach house at Island State Park with his family during the Fourth of July weekend. An NJ Advance Media photographer in an airplane got the shot of him lounging on a chair in shorts, sandals and a Mets T-shirt and hat. Artists create sand sculpture of Chris Christie lounging in beach chair: Alicia Vitarelli reports during Action News at 4:30 p.m. on July 5, 2017. That inspired Wisniewski and other Democratic lawmakers to try to put a stop to it from happening again, including the measure to prevent the state from shutting down public parks during government shutdowns. "Most camping trips or outdoor plans are made weeks or months in advance. It is unfair, and unreasonable to hold residents' holiday plans hostage over the Governor's and the legislature's inability to meet the budget deadline," Democratic Assemblywoman Valerie Vainieri Huttle said. Christie defended his visit to the shore while the public was denied access, saying earlier this month that he had previously announced his plans to vacation at the state-owned governor's beach house and that the media had simply "caught a politician keeping his word."